Today’s Profession and Business have to deal with various laws of Indirect taxes together. They need to adhere the laws of Service Tax, Excise and Customs simultaneously. 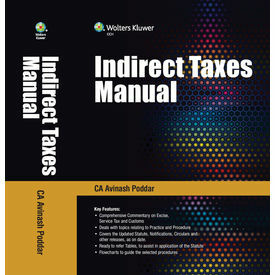 Indirect Tax Manual is an attempt to bring in the provisions of all the three Statute, namely Excise, Service Tax and Customs at one place, for the ease of the practitioners and professionals dealing with Indirect Taxes. The comprehensive commentary covers the practice and procedures under the three statute, with reference to the updated legislations, Rules and landmark judgements. Covers the Updated Statue, Notifications, Circulars and other releases, as on date.